Take your certificate to the DPS to get your license. Immediate download of your certificate is available once you complete the course. Hard copies with expedited delivery options are available from your account page. Download it after purchase to take the course on an iPhone or iPad! Our mobile app makes our online course more convenient from start to finish. No classroom or boring lectures. Learn at your own pace, from home, school, or on the go. The Texas Department of Licensing and Regulation (TDLR) requires every school to purchase state-issued certificate numbers. 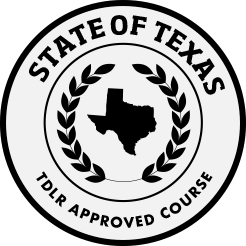 The TDLR also requires specific security features on each document so they can be validated by the Department of Public Safety when you apply for your instructional permit or license at a Driver License Office.